The 'Fei Mong' Wing Chun Kung Fu Association of Washington is proud to announce that we are part of the Millcreek Martial Arts Center! Find out more about the Center at www.milcreekmartialartscenter.com! 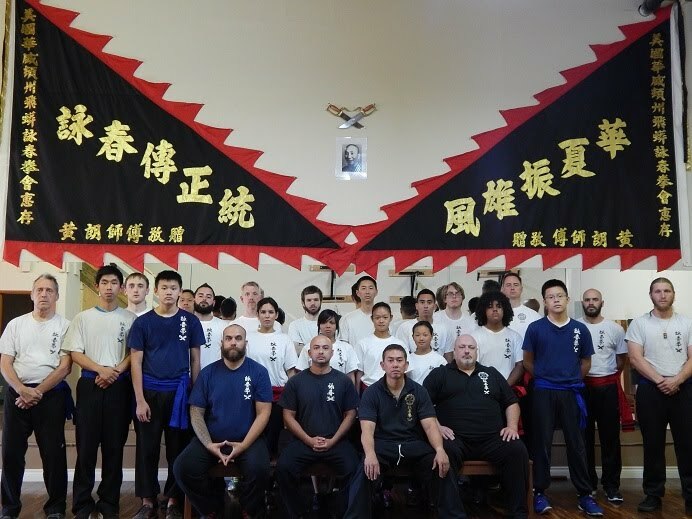 Welcome to the home of the Fei Mong Wing Chun Kung Fu Association of Washington! Here, you can find information about our style, schools, instructors, lineage, news, and links to some of our other Wing Chun Brothers from the Hawaii Association. We are here to answer your questions and hopefully help you start on your Wing Chun Path. and the Annual Potluck, usually in July or August, where we train then eat and enjoy a Summer day together. While we do have "ranks" these are not associated with a "belt color" and are merit driven. As of January 2016 we are sharing a new space, with the Hufana Arnis school, called The Millcreek Martial Arts Center! A little about our Wing Chun Association! The 1st Wing Chun, WA. was opened in 1998 in Oak Harbor, WA. by Sifu Ed Dumancas. Since then, he has taught Wing Chun in Mount Vernon and Marysville, WA. Today, his teaching has moved to Lynnwood, WA. where he teaches a small group of practitioners. For more information about Sifu Ed, see his bio page. Our association has 3 instructors under Sifu Ed, who teach in various places in the Pacific NorthWest. You can learn more about what areas they cover on our Classes and Locations page. Our lineage is Grandmaster Ip Man, Master's Wong Long Ching and Wong Chok followed by Master Robert Yeung and Sifu Ed Dumancas. Thank you to the good folks at that website. In our school we teach the San Sik movements, Chi Sao, the 3 unarmed forms, the 10 dummy sets, the long pole and butterfly sword sets. We also teach the fighting concepts, strategies, and maxims of Wing Chun. Wing Chun is a fighting style designed to quickly maneuver opponents and aggressively control the center-line. Emphasis is placed on strategy and direct explosive movements, center-line principals, and proper body angling/position. We do not focus on any tournaments or point systems in our training. Protecting ourselves and loved ones is the goal of this style. The origins of the style are lost in the mists of time. We believe the story of Yim Wing Chun learning from the Buddhist nun in order to stave off an unwanted marriage to a local brigand. Key Words, Keywords, Lynnwood, Seattle, Edmonds, Mukilteo, Everett, Shoreline, Snohomish County, King County, Island County, Oak Harbor, Martial Arts, Puget Sound, Gung Fu, Self Defense.